BPFJ hosts meetings that are open to the public on the second Wednesday each month at 7 pm at 2316 Wentworth St. Houston, Texas 77004. Their telephone number is 713-533-1057. You can also visit BPFJ Website. 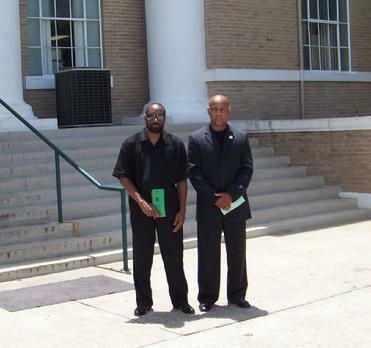 Erskin Hill (right) in front of the Polk County Courthouse in Livingston with a member of his security staff. Both hand out brochures to anyone who's interested.